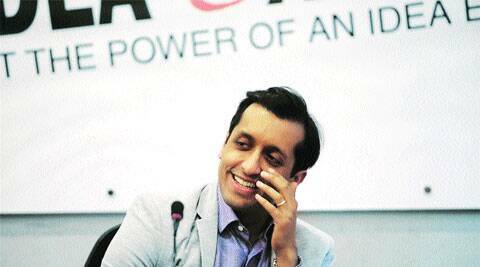 Rishi Jaitly: Everybody loves to jump to what’s interesting on Twitter. Twitter was invented as an SMS status update service in California around eight years ago. During an earthquake in San Francisco, the founders of Twitter understood what they had stumbled upon when people began tweeting, ‘Did you feel that?’. Immediately, it became clear that people could effectively use this tool as it encapsulates public conversation live. When I took up this job and came to India, I did a lot of research about the history of Twitter in India, trying to understand when people first started using it here. Many people started taking note of Twitter during the 26/11 attack. That is when we saw a surge of tweets on our platform. You can find tweets sent from Colaba in Mumbai that night saying, ‘I’m trapped’. Since then, the history of Twitter has reflected what’s been happening in our national psyche — whether it’s India’s victory in the World Cup or the protests in Delhi in 2012. I remember sitting at an airport and getting to almost hear the roar of the crowd. That’s what we think of Twitter as — this idea of a town square, where you first follow, and then you connect with others. Mr Arvind Kejriwal tweeting or a bunch of boys in Mumbai tweeting about a candlelight vigil at Colaba is what Twitter is all about. The IPL brings in a lot of energy on Twitter. Last year, during the Delhi Assembly elections, Twitter was used by the Aam Aadmi Party. During the last couple of years, we have become much more central to public conversation in India. More than a quarter of a billion people use Twitter worldwide. We are very excited about the ways that India has responded. What we care about is growth. We are doing many things in India. Twitter as a platform is rich in media, and India as a country enjoys its media. We can add value and delight to every single Indian every single day. In this election itself, from Mr Narendra Modi to Congress leaders, many people were using Twitter. You could dial a phone number to receive Mr Modi’s tweets via SMS. It was the same with the Congress. Anant Goenka: You’re talking about getting people on Twitter. A year-and-a-half ago at the Ramnath Goenka Awards, we had a panel discussion on “Who’s afraid of social media?” and Arun Jaitley, Kapil Sibal, Aroon Purie, Madhu Kishwar and Manish Tewari and others weren’t on Twitter. Fast forward to today, and everybody from that panel is on Twitter. One of the things we are delighted about is how many people are coming to Twitter on their own. We have taken this genre of conversation very seriously. Over the past couple of years, I have personally spent a lot of time articulating the value of Twitter. One of the lessons I have learnt is that the rise of Twitter may seem inevitable and inorganic, but we all know that we could do a better job in making Twitter easier to understand. One of the things we are working on as an organisation is making Twitter easier for new users. It is a new form of media. Mr Modi has been replying to world leaders and now there is a story of a new romance between India and Japan as a result of his tweets with Prime Minister Shinzo Abe. When the question arose of why he took two days to reply to the message from the US, it showed us how we are all watching public discourse in ways that we haven’t before. The magic of Twitter is actually in discovering content. When we meet public figures from around the world and in India, one of the first things they tell us is, ‘I use Twitter and follow you’. So one of the first things we try to share with Mr Jaitley or Mr Tewari or Mr Sibal is that Twitter is your source for what is happening around the city, other capitals. I think that works. Anant Goenka: You mentioned Modi as actively responding to world leaders on Twitter. This makes me wonder if the PMO handle controversy is relevant. Modi has got four times more followers on his personal name than PMO India archive has. And why is that individuals are getting more following than any department or brand? World leaders and heads of state look at their personal accounts as opportunities to be more personal. They use their institutional accounts for more official updates about what is happening in an executive office. Twitter can bring anything to life in the first person and that is what audiences crave on Twitter. Seventy-six per cent of our users worldwide use Twitter on a mobile phone. What is a mobile phone? They are places of personal communication where, before Twitter, you could message your mom and leave a missed call with your brother. What you want to be consuming is raw, authentic, typo-filled messaging. And that may be a dramatic way to explain why people do better than brands on Twitter, but then the lesson there is that Twitter presents an opportunity for brands to personify. One of the things that Headlines Today news channel did was that they renamed their Twitter account for election period. It became @electionexpress. When Pepsi and MTV wanted to launch their MTV Indies channel, they tweeted to one another. MTV said, “Hey Pepsi, good morning, what’s up”. Pepsi replied, “I’m good, what are you up to today?”. Oreo and Kit Kat tweet with one another, and play tic-tac-toe with one another in public. One of the things I am hopeful of in India is government organisations embracing this as well. It’s nice to see that Mr Modi has understood the value of being human on Twitter. Coomi Kapoor: How much has the volume on Twitter gone up during the elections and is it true that Mr Modi’s tweet was one of the widest circulated one in India? The first thing he did after he won the elections was seek his mother’s blessings, and tweet, “India has won. Achche din aane waalein hain.” And that one tweet, within an hour, became the most re-tweeted tweet in the history of India. In the past one year, the conversation around politics in India has gone up by more than 600 per cent. The extent to which political candidates and parties are mentioned on Twitter has gone up more than 10-fold in a year. Anant Goenka: When you went and spoke to Congress MPs during your first few months here, Subramanian Swamy tweeted that you are only speaking to Congress MPs. When Raheel Khursheed — Twitter India’s new chief of news, politics, and government — joined the site, he was in the news because he had tweeted about Modi. How do you strike a balance? I don’t think there is anything to reconcile. We are a platform, interested in seeing more and more users and publishers. And we are not alone. Many of our brethren in the industry do the same thing. You can be editorial as well as evangelist, and highlight best practices all at once, which is what we have been doing. Unni Rajen Shanker: Recently you had Rajnikanth’s newlyopened account advertised on the site. Was it your strategy to promote Twitter, or was it to promote Rajnikanth’s new movie? Those of you who have Twitter accounts receive emails from Twitter. We call it below the line marketing, where we try and get users to engage even more with the content. So we were super excited when Rajnikanth chose Twitter. As far as I know, he doesn’t have a website. I think what he saw on Twitter was an opportunity to engage with fans. You may have seen his tweets with Mr Modi and others. Our work is to let users know that this is an account worth following. Coomi Kapoor: Can you tell us a little about your background? I’m originally from New York. My parents grew up in India. Mother grew up in Madras and father is from Delhi. I wanted to be a physician until college and then decided to pursue public service. I decided that my mission in life is to make a difference, make a positive impact — a fairly naïve thought. Studied history, US-Indian relations in college and I was interested in Indian immigration and migration patterns around the world. I decided to initially begin my career focussed on education, so I worked for an NGO in the US that helps low income students. Then I joined Google. I moved to India for the first time seven years ago, to Delhi. I was doing Google’s work during the last elections. Then I decided to be a social entrepreneur and started an NGO in Detroit, Michigan. Then I joined Twitter. For me, it’s always been mission driven. All of us at Twitter believe in the power of the human voice and Twitter is one of the most powerful examples of that. Anant Goenka: A lot of people are speaking about fake accounts. Is that some thing that is really happening and to what degree is it true? We have found that people take Twitter very personally. So the issues which have been endemic to the Internet, like spam, objectionable content, exist here too. But when they manifest themselves on Twitter, people get agitated because they take Twitter personally. That is something we take pride in. Spam is specifically a problem of the Internet. Twitter takes spam very seriously. We talked about it and there is an entire section dealing with spam and how strategic it is for us to invest in spam operations. We have a 24X7 operations centre responding to content that might violate our terms and conditions. Anant Goenka: Would you say that the entire social media phenomenon behind AAP, Arvind Kejriwal is authentic? By and large their embrace of the Twitter platform has been a result of acute understanding of Twitter. Mr Kejriwal getting slapped and tweeting about it five minutes later, Mr Modi winning an election and tweeting one minute later…That represents a very nuanced understanding of the power of Twitter. Anant Goenka: Do you perceive Facebook to be competition? We are the only platform in the world that is live, public and conversational. Nandagopal Rajan: Do you get requests from people asking you to take down anything that could be libellous and how do you do that? This idea of trolling is endemic to the Internet. If you look at the news section, comments to articles, if you look at letters to the editor 50 years ago — this idea of complaining has always been around. What Twitter has done is that it has made people more animated. While we whole heartedly believe in the idea of a real-time open public platform, we need to make it easier, particularly a conversational tab. If you are on Twitter, you can actually filter your replies by people you follow. Anant Goenka: Everything you’ve said so far about Twitter doesn’t seem to make you any money. This is all intended to be free. Twitter hasn’t made any profit in the last two-three years. Is that a source of concern or would that be different in India? We describe Twitter as an interest graph. Who you follow, what you tweet about, what you re-tweet is a powerful commercial signal in the market place. People are coming to Twitter to connect to brands, entertainment. We’re quite bullish about our potential with advertisers and all promoted products in India have been open for the last four quarters or so, and brands across India are running promotional tweets. We’re trying to engage with potential consumers. Aleesha Matharu: You said that the world loves its visual media, so do you see Instagram surging ahead of Twitter? Data shows that monthly users on Instagram in the US has been increasing and that of Twitter falling to a slight degree. What you see on Twitter is content that is organised, optimised for conversation and that travels — that’s where we’re going to invest. We feel as though we’re a mission-driven company, a lot of us came to Twitter from eclectic backgrounds, interested in social change and making a difference in the world. The world’s town square is Twitter. The ability to understand what people are talking is something we take very seriously. That’s why we’re growing and people flock to us. Dilip Bobb: What’s the downside? Some people say we live in public now. I say that’s life. With each new communication consumption medium, you confuse norms, habits of consumption change — like with Twitter and its 40 characters. At the end of the day it’s all relative, arbitrary. We’re moving towards a period where short form content is what audiences crave for and there are many studies about the impact of short form, mobile and digital content. Aleesha Matharu: Are you signing up with DTH operators? How would that work? The intersection of TV and Twitter is fortuitous. You can make the case that TV is essentially a schedule of events. Twitter on the other hand is a network of moments. Both TV and Twitter are live, public and conversational. We have producers in the US broadcasting shows and checking Twitter to see the audience’s response. Producers of live content use Twitter to gauge the pulse of the audience. Producers of content are optimising for Twitter. If the media is moving in a direction where engagement matters just as much as reach, Twitter is a pretty powerful proxy for engagement. We use tweet spots. Moments in shows that are likely to provoke audience reactions use Twitter to reach out. During the IPL, you see hashtags related to it on screen. If you’re watching Sachin Tendulkar’s farewell, you have an opportunity to get a momento from him by tweeting to Sachin, and then you have a personal autograph. DTH providers are observing that consumers are increasingly craving for a quick and easy access to the second screen. We are getting ready for a world in which conversation is objective and not a means to an end. Dilip Bobb: How much of a disadvantage is it now for a politician like Rahul Gandhi not to be on Twitter? You should ask him that. This platform has become essential for serious leaders in the audience business. Though people are still learning, I think Twitter has arrived in India. We are the second screen of TV, public space of discussion of politics. We are how users connect to cricket, we are a source of comedy. Leela Prasad: You said Twitter stands for free speech. Does propaganda come under the same definition, because al-Qaeda and Naxals too have Twitter accounts. If a Twitter account violates the terms and conditions and if things shared are threatening violence or aggressively abusing people, those accounts can be reported.